As I trudge along the shore towards the ledge I want to fish the sky is just beginning to lighten in the east. The tide should be far enough out for me to scramble onto the vantage point that I've chosen. Sure enough I am able to splash through the wrack filled pools and heave myself up onto the slabs of barnacle encrusted limestone - excellent! 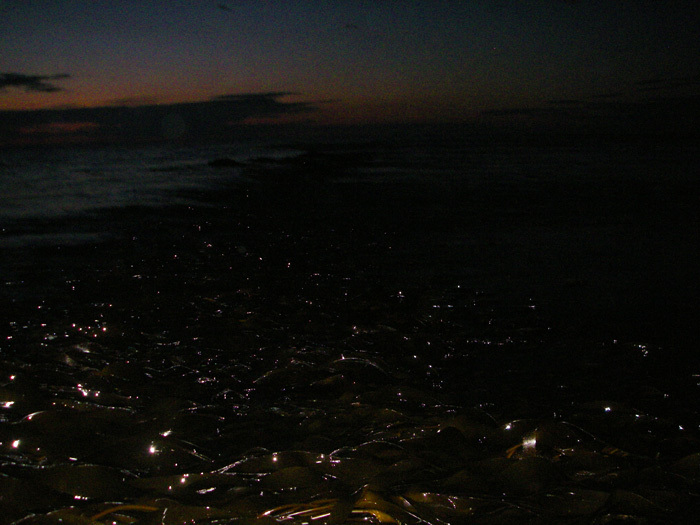 It is still pretty dark but I can see the fronds of kelp glistening in the faint light from the sky and out in the calm sea there are numerous dark clumps of the tough leathery straps breaking the surface. I put my bag down on a dryish rock and make my way to the tip of the ledge where the last of the ebb tide is still rushing out like a huge river. Normally this spot is unfishable under these conditions. I know that it is unfishable because, in the past, I've lost a number of plugs and poppers to the tough rubbery stalks of weed. Well, nothing ventured nothing gained, so I tentatively flick my Slug-Go/Super Sandra (yes I'm sticking to my plan to give it a thorough testing) a few metres out into the race. I raise the rod tip and let the lure hold in the current. No problem, it swings round in an arc until it is in the slack behind the ledge and I slowly wind it in. Somewhere out in the gloom I hear a splash. It must surely be a fish moving! Encouraged I cast again, this time a bit further. I imagine the soft, flexible tail of the lure wriggling in the flow of dark water. "Come on fish!" I mutter to myself. Nothing happens but once more the lure comes back unscathed by its journey through the forest of weed. I become bolder and try a couple of long casts. Still the weedless lure does its stuff perfectly. I try a cast into the glassy water uptide of the ledge and wind in a bit faster to compensate for the flow coming towards me. The line swings round over the ledge. I can't see anything but the lure must only be five or six metres away from me now. I'm shocked by a mighty splash just about where I think my soft plastic eel must be. I feel nothing but there's no doubt in my mind that something had a go at the lure. I make another cast that lands just upcurrent and a little way beyond where the fish splashed. Hold the rod up and let the lure swing across the current. Crash! bang! wallop! the rod jerks violently in my hand and I'm in. Splashing and thrashing the bass, it must be a bass, drags off line against the clutch. I stumble backwards in the dark over the weedy rocks. Careful Mike! The fish is beginning to tire and holding the rod high to slide it through the kelp fonds I bring my catch towards where I'm standing. It flaps and slithers its way onto the ledge so I bend down and holding the 20lb mono trace I drag it safely into a dip in the rocks before laying down the rod and going to get my camera from the bag. I must be stupid! Once again I haven't brought a torch or headlamp so I won't be able to focus the camera properly. Never mind, it's still worth a picture or two, just to record the event. I can't see my catch on the viewing screen but as I release the shutter (or whatever passes for a shutter in digital cameras) it appears briefly in the light of the automatic flash. A couple more shots for luck. Put the camera away then bend down and unhook the fish, no problem with the big single hook. 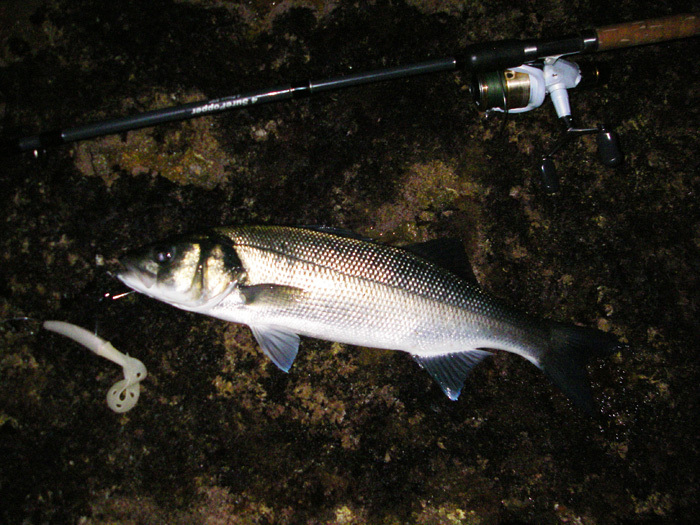 I pick up the bass, four or five pounds, and slip it back into the sea where it shoots away with a flick of the tail. I pick up the rod and have another two or three casts but it's already low tide now and the race has stopped. There's kelp everywhere and I have no more bites. Still it's going to be a lovely warm morning. Time to go back for a well earned breakfast.